Q:Can a teabag (looking at the personalized ones you sell) fit in this box? A:Unfortunately, the top of this box is too narrow to fit our tea bag without bending the bag. A tea sachet would fit! Q:Can candy fit into this box? A:Yes, these favor boxes can hold up to 3 ounces of candy. Q:Does the favor box come with the printed label? 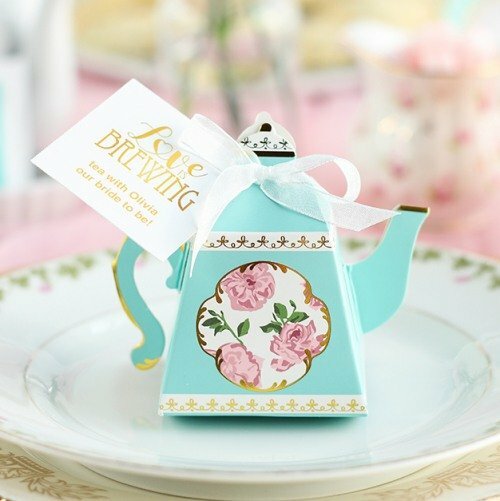 When it comes to favors, the packaging is half the fun — and these teapot favor boxes make the perfect choice for any tea party themed event.